From a advertiser’s perspective, I feel that one of, if not, the most important aspect to a PPC campaign is it’s landing page. I have often in the past described PPC as a domino effect. Every step that moves a web visitor closer to viewing your landing page is like a domino falling over in a sequence. Having a bad landing page with a low conversion rate is like having the last domino not fall over in the sequence. The landing page is what makes or breaks a campaign which is why it needs to be optimised for the highest conversion rate. As well as this, normal bloggers can be seen to improve their landing page too. The content is there, how should you display it? A different theme, layout, font, size and mix of widgets will provide different results for the blogger which, when the blogger knows his objective for his landing pages, can choose from to make live on his website. You may not know this but there are many different types of landing pages to choose from. To improve your landing page, you need to choose a landing page layout which suits your PPC objectives. For example, if you want to gain a good range of emails to market products and services to, you may find that a lead capture page is the right landing page for you for the highest conversion rate. Whereas, if you want to just let people know about something, an infomerical page is the one for you. Adding social media buttons to a landing page is one of the best ways to optimise it and bring in an extra source of traffic. With the buttons taking up minimum space of your landing page, it can potentially bring in quite a lot of traffic for no extra fee. This is because most PPC campaigns only have paid contextual traffic entering a landing page. However, if you add social media buttons, the paid contextual traffic from PPC will be encouraged to share the landing page with their social networks bringing in even more traffic. From my perspective, it’s a no brainer to add social media buttons to a landing page. One of the main reasons advertisers cannot improve their landing pages is because they don’t specifically know what is wrong with it to begin with. They have no statistics except their CTR, CPC and impressions about their landing page (and them three statistics have alot of other variables that can change them). For this reason, it is highly recommended that you install Google Analytics onto your landing page. In doing so, you will be able to find your landing page’s weaknesses and look to improve them. 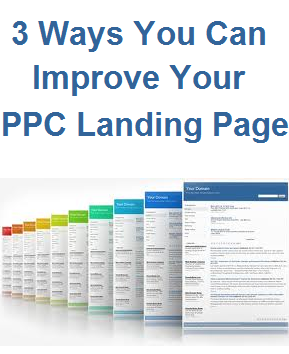 If a landing page doesn’t perform in a PPC campaign, your whole PPC campaign won’t perform. It has a huge effect to the success rate of a campaign which is why I feel it is one of the most important aspects to a campaign. You have done the hard work of getting the targeted potential customers to your landing page. Now, get the conversion by making a successful landing page. Typical And Common PPC Questions: Answered!